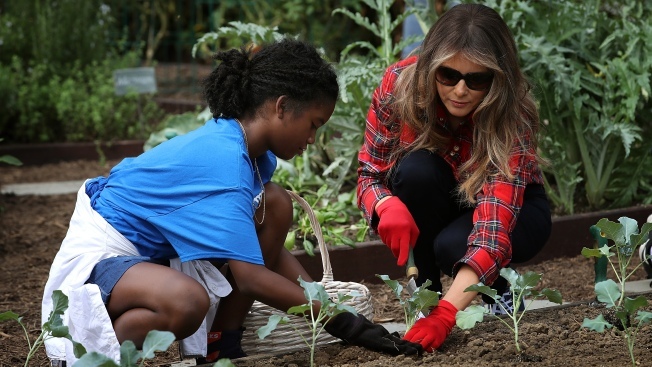 U.S. first lady Melania Trump joins children from the Boys and Girls Club of Washington in planting and harvesting vegetables in the White House Kitchen Garden September 22, 2017 in Washington, DC. In just a few weeks, you will be able to get an up-close look at the White House's grounds and gardens. The spring garden tours will be held from 10 a.m. until 4:30 p.m. on April 14 and from 10 a.m. until 2:30 p.m. on April 15, the Office of the First Lady announced Monday. Guests will have the chance to explore the Jacqueline Kennedy Garden, the Rose Garden and the White House Kitchen Garden. Visitors can get free tickets starting at 8:30 a.m. on each of the tour days at the National Park Service tent, near the intersection of 15th Street and Constitution Avenue NW. Tickets are given out on a first-come, first-served basis.